Petrified Wood: The Wood that Rocks! All fossils are rocks, but not all rocks are fossils. Once-living organisms can become preserved and, under the right conditions, the organic tissues of the organism can slowly become replaced by minerals such as calcite or quartz turning the remains into stone. This process applies to wood as well as the better known ammonites and dinosaur bones most people think of as fossils. 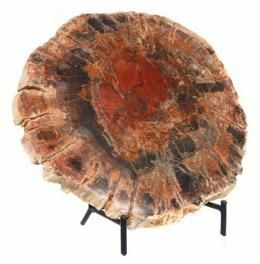 Petrified wood can occur in any number of colors due to trace elements that find their way into the replacement minerals. Because this process occurs atom by atom, many of the wood structures and textures can be perfectly preserved including bark, knots, and even tree rings! Sometimes the knots and hollows of a limb will fill in with druzy quartz. Although most petrified wood ends up replaced by the chalcedony member of the quartz family, some specimens have been known to form from hematite and even malachite replacement. This process can take thousands of years to occur after the decades to centuries of life represented by the wood itself. As one would expect, petrified wood has been adopted by the New Age community as a talisman representing new beginnings and ancient wisdom because of its transformation from a mortal state to an immortal form. The strong association with trees that the petrified wood comes from means that it can help one to appreciate nature and the nature of time. With this appreciation one recognizes the cyclical patterns of life, death and new life, which can then be applied to transform oneself and begin a new season of one's lifetime. The grounding properties of petrified wood provide us insight into our familial and spiritual roots. There are plenty of places that you can go rock-hounding for your own petrified wood. Toledo Bend in East Texas hosts petrified palm wood, the state stone, representing a time 100 million years ago when Toledo was beachfront property due to a shallow sea that spanned across most of the state.